The payout might have a lower yield, but there's much better security and potential in the bank that is issuing it. Once upon a time, a notorious criminal was asked why he robbed banks. The answer was almost charming in its simplicity: "Because that's where the money is." Because banks are still where the money is (vast amounts of it, at times), they often hand out regular dividends to their stockholders. All of the "big four" nationwide American lenders do so. Of this quartet, Wells Fargo's (NYSE:WFC) payout has the highest yield, and Bank of America's (NYSE:BAC) the lowest. But I believe the latter is the superior dividend stock regardless. Here's why. Now, why did I pick that date for the start of my graph? Because that was when Wells Fargo's "fake accounts" scandal broke. Wells Fargo isn't the first member of the big four to misbehave. What's disturbing is that, unlike its peers, it doesn't seem to be learning its lesson. There have been a raft of new scandals at the bank since then, over products such as mortgages and vehicle loans. For a depressing catalog of malfeasance, here's a handy list of those scandals (at least up until last August). In an attempt to curb the bank's bad behavior, the Federal Reserve ordered that it must keep its total assets at $2 trillion or below. It seems this limit will last through 2019, at a minimum. Banks can't really grow their fundamentals if they can't add to their assets. Wells Fargo, then, is stuck in neutral; meanwhile, the American economy continues to rise. Banks that aren't handcuffed by the financial cops tend to see their fundamentals more or less move in concert with the broader economy. In a growth situation, businesses and individuals are confident they can make borrowed money work for them, so they tend to take out loans. In an economic downturn, they are less brave. Bank of America has really been capitalizing on the current up cycle. Its Q4 of fiscal 2018 saw the lender reap a net profit of $7.3 billion, its all-time quarterly record. It is also handily trouncing the average analyst estimate (and rising almost 50% on a year-over-year basis, adjusted for the recent changes in corporate taxation). That was on revenue of nearly $23 billion, a 6% increase on an adjusted basis. This result was also comfortably above prognostications. What's going right? Besides the economy, a long-tail push into automation and e-banking that began several years ago is helping results; mobile banking usage rose by 16%. This is encouraging news for a bank that could stand further reduction of its gigantic brick-and-mortar footprint. No wonder its all-important efficiency ratio fell nicely to 58%, from 62% in Q4 2017. There's every reason for the bank to hike its dividend, and if recent history is anything to go by, it should do so generously. Every year since 2016, it has been granted a significant dividend hike by the Fed (which by law must green-light the capital allocation plans of big banks). 2016 saw a 25% lift, the 2017 raise was 60%, and last year the bump was 40%. OK, this is working from a low floor -- on a per-share basis, the dividend is still only $0.15 per share -- but an improvement in yield is always happy news. Check out the latest Wells Fargo and BofA earnings call transcripts. There are too many questions about Wells Fargo's business practices for me to be comfortable with the stock. Granted, the bank can earmark more of its capital to hike the dividend (it can hardly use it to expand the asset base). But while that extra sugar might be tempting, a higher dividend's value is very limited if its source is a bank with a stagnant asset base, a poor reputation, and little indication that it's fixing its worst habits. 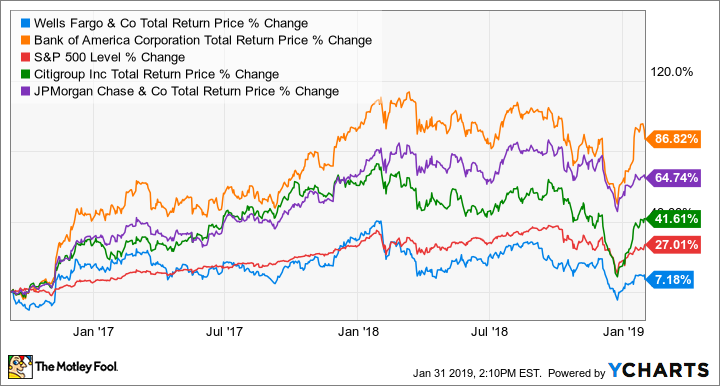 So in my opinion, sturdy and growing Bank of America is the better dividend stock at the moment.